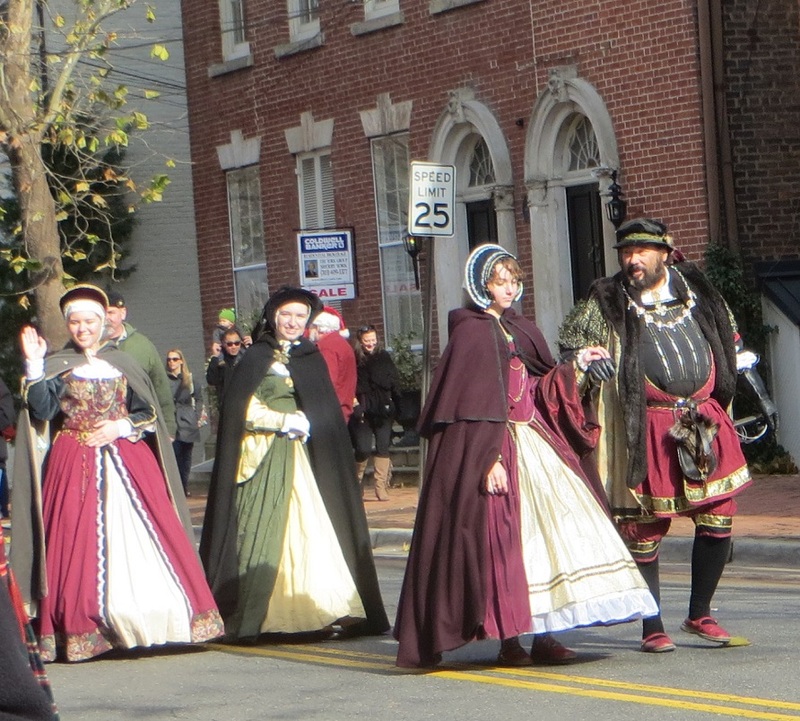 December 7 was a beautiful, sunny day for Alexandria, Virginia’s Scottish Walk parade. 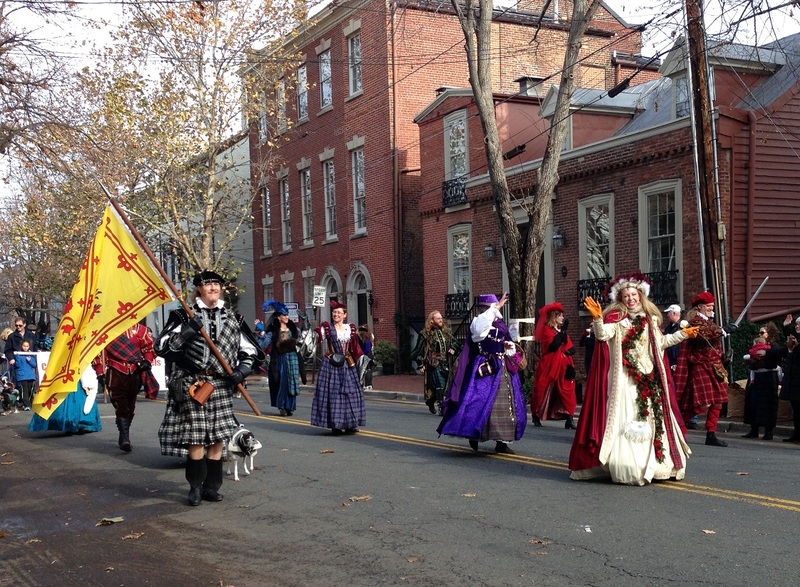 Sponsored by the Scottish government, the St. Andrew’s Society of DC and the city of Alexandria on behalf of the Campagna Center, a local social services agency, it happens annually on the first weekend of December. 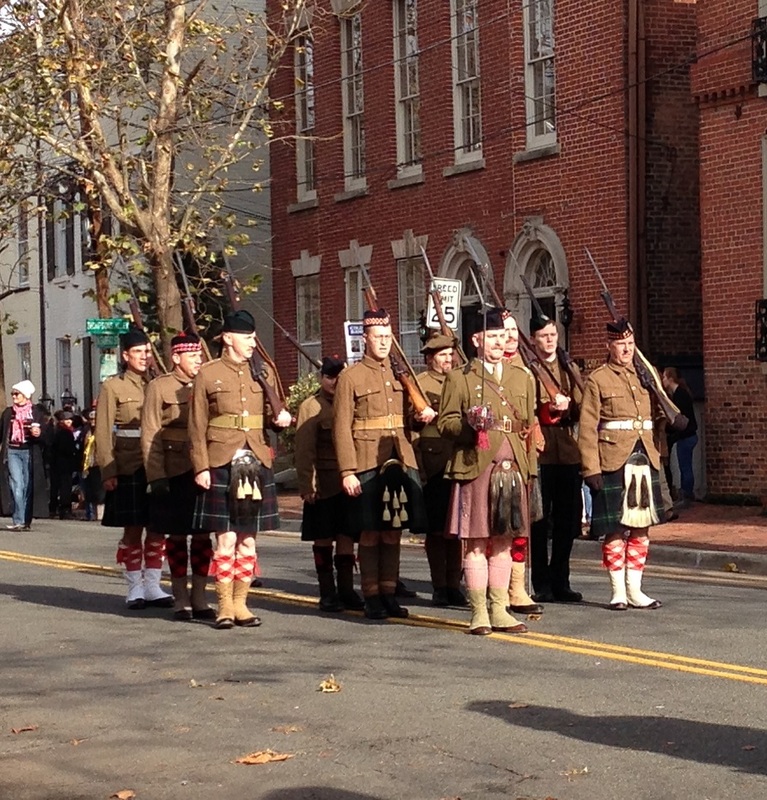 …and watched local politicians, diplomats, scouts, dogs, reenactors and Santa march by to the music of bagpipes and drums. 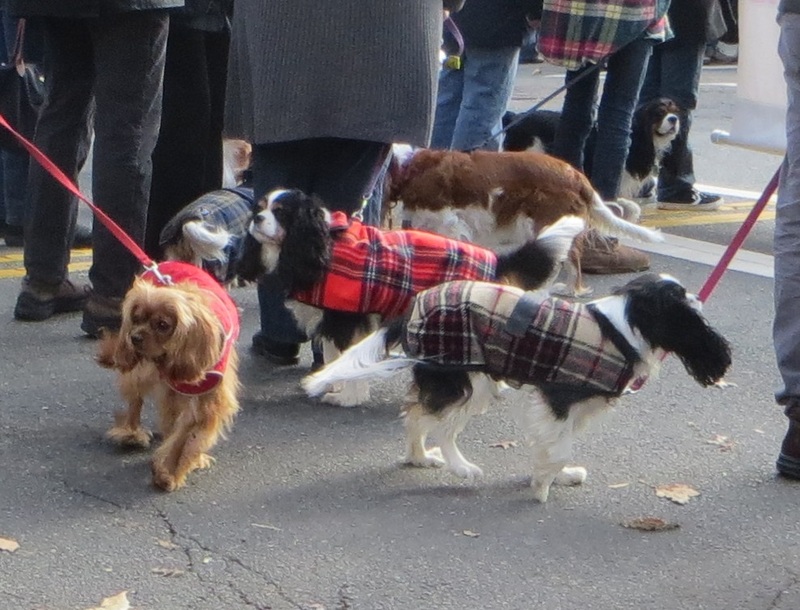 Everyone was in tartan, even the dogs. Alexandria, across the Potomac River from Washington DC, is best known for being the “hometown” of George Washington. It was named for cousins Philip and John Alexander who, in the late 17th century, bought up some swamp land bordering the Potomac and developed it into a major port and mercantile center. I have no idea how Henry VIII ended up in Alexandria. The Alexander family had immigrated from Scotland — like several of the families who would become prominent in Alexandria — and based on this early start, Alexandria has become the hub of all things Scots in the greater DC area. 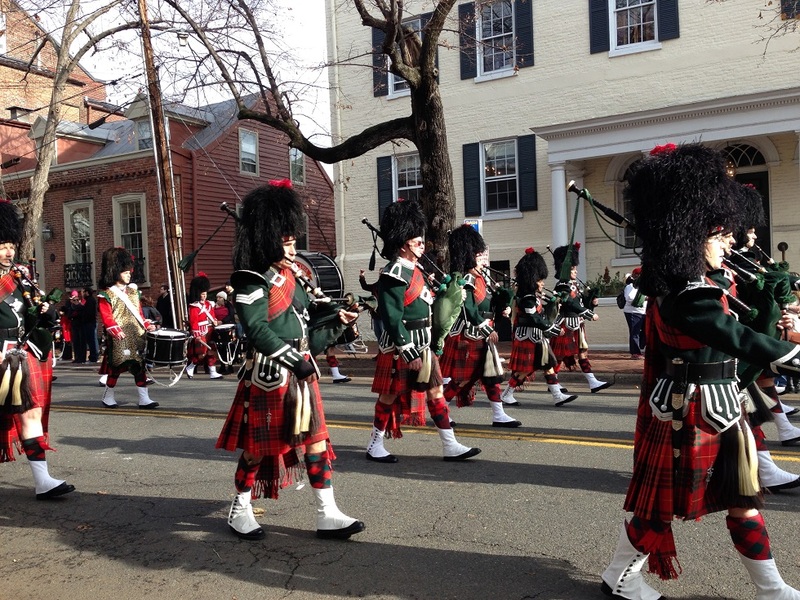 There’s the Tartan Day Festival, the Alexandria Scottish Heritage Fair, and the City of Alexandria Pipe and Drums. Mr. HistoryTourist, who is Scottish on his mother’s side (Clan Grant), had dragged me once to the Virginia Scottish Games. 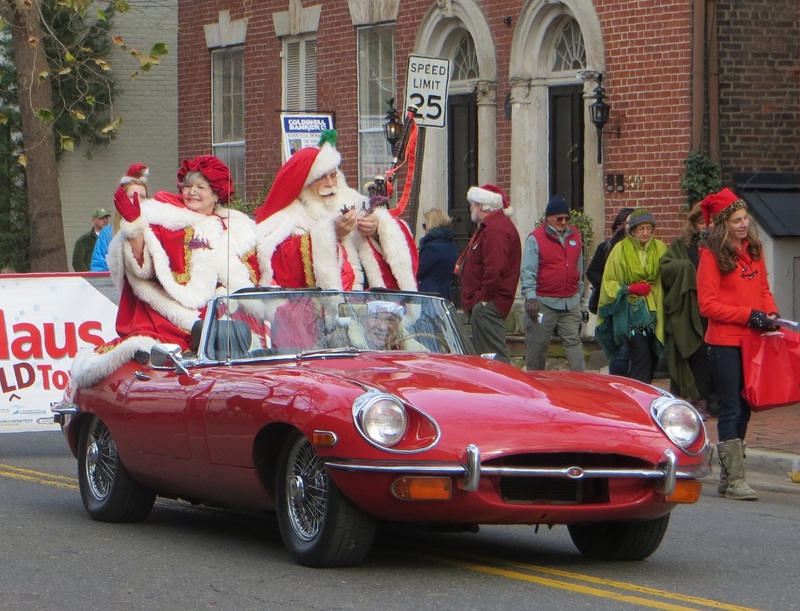 So I thought he might be interested in going to Alexandria’s annual Scottish Walk Christmas parade. He wasn’t. But my friend Kathleen was, so we took advantage of the gorgeous weather and had a girl’s day out. Very important: the parking garage under its town square is $4 for the entire day on weekends (free until 11 am on Saturday morning market days). Alexandria is full of fun little shops and restaurants. And lots and lots of bagpipes. Even Santa played one. 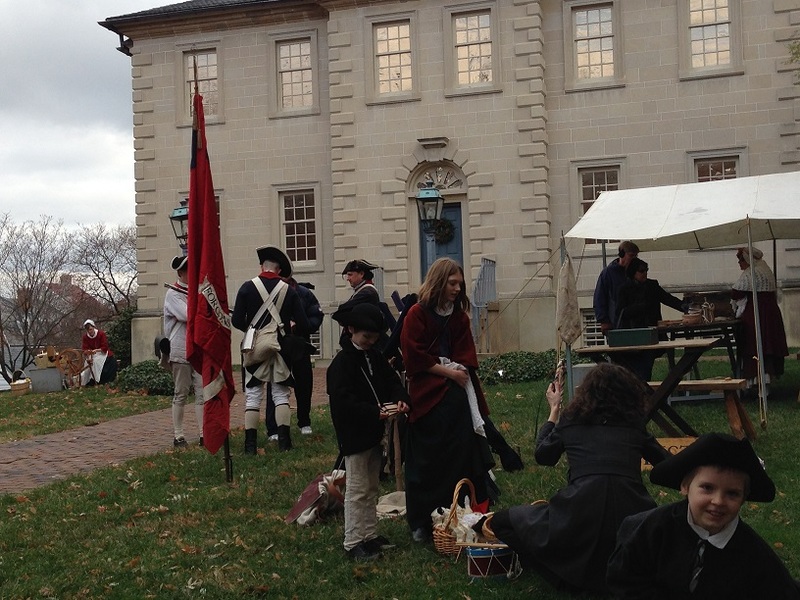 Gallery | This entry was posted in Virginia and tagged Alexandria, Carlyle House, Scottish Walk, Virginia. Bookmark the permalink. Looks like fun. I have two friends who go every year. I grew up in Northern Virginia, but never knew where the name Alexandria came from. Happy holidays! It was a lot of fun. I’m not sure it would have been worth standing in the freezing cold, but there’s nothing better than a parade on a beautiful day. Happy holidays! I was there too! It would be awesome to do a planned joint-blog about an event with you sometime! That would be a lot of fun. We do seem to end up in many of the same places. We sure do! Just let me know an event that you think would be fun to attend or a place to go! It was a lot of fun, although I’m not sure that I’d have been as happy had it been colder. Its a perfect thing to do on a warmish day. How fun that Gib has a reenactment parade on Saturdays. This area has more than its share of reenactment events too. I’m so lazy that I watch them out of the window, wander down the street to where they meet, just down from us. When I’ve taken photos, I actually like the informal ones of them walking and chatting rather than the actual parade.